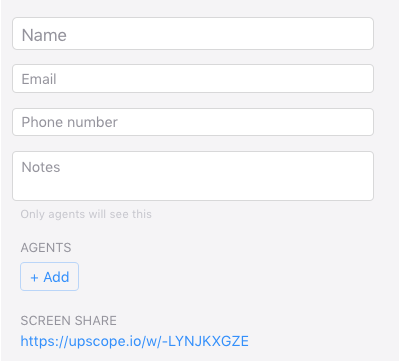 Upscope integrates with Chatra allowing one click screen sharing. Upscope integrates with Chatra allowing you to go from chat to viewing a user's screen in seconds. To integrate Upscope with Chatra, simply copy and paste the installation code beneath the Chatra code. That's it. When you open Chatra and click on an individual chat, you'll see a 'SCREENSHARE' link appear in the panel. Click on that to go directly to their screen. Click again to take control and guide your user on their machine as they sit back and watch.